There is evidence that climate is modifying natural mountain ecosystems via complex interactions and feedbacks including, for example, solar radiation micro-scale processes on Mt. Kilimanjaro (Molg and Hardy, 2004; Lemke et al., 2007). 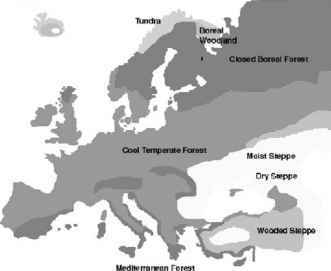 Other drivers of change are also modifying environments on the mountain, including fire, vegetation changes and human modifications (Hemp, 2005). During the 20th century, the areal extent of Mt. 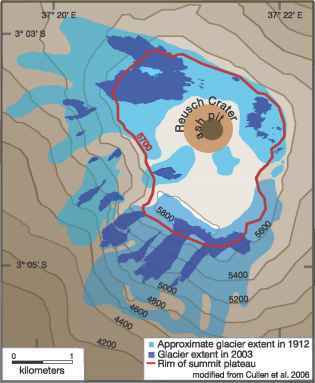 Kilimanjaro's ice fields decreased by about 80% (Figure 9.2). It has been suggested that if current climatological conditions persist, the remaining ice fields are likely to disappear between 2015 and 2020 (Thompson et al., 2002). Figure 9.2. Decrease in surface area of Mt. Kilimanjaro glaciers from 1912 to 2003 (modified from Cullen et al., 2006). in Mozambique - Christie and Hanlon, 2001; IFRCRCS, 2002; see also various infrastructural loss estimates from severe storm events in the western Cape, South Africa -http://www.egs.uct.ac.za/dimp/; and southern Africa - Reason and Keibel, 2004). Large numbers of people are currently at risk of floods (see, for example, UNDP, 2004; UNESCO-WWAP, 2006), particularly in coastal areas, where coastal erosion is already destroying infrastructure, housing and tourism facilities (e.g., in the residential region of Akpakpa in Benin (Niasse et al., 2004; see also Chapter 7, Section 7.2.). 2006). This has produced a 'freefall' in the Human Development Index ranking, with southern African countries accounting for some of the steepest declines (UNDP, 2005). Indeed, some commentators have noted that sub-Saharan Africa is the only region in the world that has become poorer in this generation (Devereux and Maxwell, 2001; Chen and Ravallion, 2004). A large amount of literature exists on the various factors that influence vulnerability to the changes taking place in Africa (e.g., to climate stress), and this section outlines some of the key issues (see, for example, Figure 9.1a-d). However, these factors do not operate in isolation, and usually interact in complex and 'messy' ways, frustrating attempts at appropriate interventions to increase resilience to change. There are important macro-level processes that serve to heighten vulnerability to climate variability and change across a range of scales in Africa (Sachs et al., 2004; UNDP, 2005; Ferguson, 2006). Issues of particular importance include globalisation, trade and equity (with reference to agriculture, see FAO, 2005; Schwind, 2005) and modernity and social justice (e.g., Ferguson, 2006). Numerous 'structural' factors are 'driving' and 'shaping' poverty and livelihoods (Hulme and Shepherd, 2003) and changing the face of rural Africa (e.g., intensification versus extensification, see Bryceson, 2004; Section 9.6.1). Structural adjustment accompanied by complex market reforms and market liberalisation (e.g., access to credit and subsidy arrangements) has aggravated the vulnerability of many in Africa, particularly those engaged in agriculture (see, e.g., Eriksen, 2004; Kherallah et al., 2004). Fertiliser prices, for example, have risen in response to subsidy removal, resulting in some mixed responses to agricultural reforms (Kherallah et al., 2004; Institute of Development Studies, 2005). Market-related and structural issues can thus serve to reduce people's agricultural productivity and reduce resilience to further agricultural stresses associated with climate change. Complex institutional dimensions are often exposed during periods of climate stress. Public service delivery is hampered by poor policy environments in some sectors which provide critical obstacles to economic performance (Tiffen, 2003). Africa is also characterised by institutional and legal frameworks that are, in some cases, insufficient to deal with environmental degradation and disaster risks (Sokona and Denton, 2001; Beg et al., 2002). Various actors, structures and networks are therefore required to reconfigure innovation processes in Africa (e.g., in agriculture) to improve responses to climate variability and change in both rural and urban contexts (Tiffen, 2003; Scoones, 2005; Reid and Vogel, 2006; see also Section 9.5). Constraints in technological options, limited infrastructure, skills, information and links to markets further heighten vulnerability to climate stresses. In the agricultural sector, for example, many African countries depend on inefficient irrigation systems (UNEP, 2004) which heighten vulnerability to climate variability and change. Africa has been described as the world's great laggard in technological advance in the area of agriculture (Sachs et al., 2004). For instance, most of the developing world experienced a Green Revolution: a surge in crop yields in the 1970s through to the 1990s as a result of scientific breeding that produced high-yielding varieties (HYVs), combined with an increased use of fertilisers and irrigation. Africa's uptake of HYVs was the lowest in the developing world. The low levels of technological innovation and infrastructural development in Africa result in the extraction of natural resources for essential amenities such as clean water, food, transportation, energy and shelter (Sokona and Denton, 2001). Such activities degrade the environment and compound vulnerability to a range of stresses, including climate-related stress. Sub-Saharan African countries also have extremely low per capita densities of rail and road infrastructure (Sachs, 2005). As a result, cross-country transport connections within Africa tend to be extremely poor and are in urgent need of extension in order to reduce intraregional transport costs and promote cross-border trade (Sachs, 2005). Such situations often exacerbate drought and flood impacts (see, for example, the role of information access in IFRCRCS, 2005) as well as hindering adaptation to climate stresses (see Section 9.5; Chapter 17, Section 17.3.2). Notwithstanding the range of uncertainties related to the accuracy of census data, the African continent is witnessing some of the most rapid population growth, particularly in urban areas (Tiffen, 2003). During the period 1950 to 2005, the urban population in Africa grew by an average annual rate of 4.3% from 33 million to 353 million (ECA, 2005; Yousif, 2005). Complex migration patterns, which are usually undertaken to ensure income via remittances (Schreider and Knerr, 2000) and which often occur in response to stress-induced movements linked to conflict and/or resource constraints, can further trigger a range of environmental and socio-economic changes. Migration is also associated with the spread of HIV/AIDS and other diseases. Several studies have shown that labour migrants tend to have higher HIV infection rates than non-migrants (UNFPA, 2003). Increases in population also exert stresses on natural resources. Agricultural intensification and/or expansion into marginal lands can trigger additional conflicts, cause crop failure, exacerbate environmental degradation (e.g., Olsson et al., 2005) and reduce biodiversity (Fiki and Lee, 2004), and this then, in turn, feeds back, via complex pathways, into the biophysical system. Variations in climate, both short and long term, usually aggravate such interactions. Changes in rain-fed livestock numbers in Africa, a sector often noted for exerting noticeable pressure on the environment, are already strongly coupled with variations in rainfall but are also linked to other socio-economic and cultural factors (see, for example, Little et al., 2001; Turner, 2003; Boone et al., 2004; Desta and Coppock, 2004; Thornton et al., 2004). 2 Water Exploitation Index: total water abstraction per year as percentage of long-term freshwater resources. >90% for Egypt and Libya (Gueye et al., 2005). Until recently, these countries have adopted a supply-oriented approach to managing their water resources. However, managing the supply of water cannot in itself ensure that the needs of a country can be met in a sustainable way. Attributing sensitivity and vulnerability in the water sector solely to variations in climate is problematic. The complex interactions between over-fishing, industrial pollution and sedimentation, for example, are also degrading local water sources such as Lake Victoria (Odada et al., 2004), which impacts on catches. Integrated analyses of climate change in Egypt, moreover, show that population changes, land-use changes and domestic growth strategies may be more important in water management decision-making than a single focus on climate change (Conway, 2005). In much the same way as the aforementioned sectors, the health sector is affected by the interaction of several 'human dimensions', e.g., inadequate service management, poor infrastructure, the stigma attached to HIV/AIDS, and the 'brain drain'. HIV/AIDS is contributing to vulnerability with regard to a range of stresses (Mano et al., 2003; USAID, 2003; Gommes et al., 2004). Maternal malaria, for example, has been shown to be associated with a twice as high HIV-1 viral concentration (ter Kuile et al., 2004) and infection rates are estimated to be 5.5% and 18.8% in populations with a HIV prevalence of 10% and 40%, respectively. The deadly duo of HIV/AIDS and food insecurity in southern Africa are key drivers of the humanitarian crisis (Gommes et al., 2004; see also Section 9.6). While infectious diseases such as cholera are being eradicated in other parts of the world, they are re-emerging in Africa. A major challenge facing the continent is the relative weakness in disease surveillance and reporting systems, which hampers the detection and control of cholera epidemics, and, as a side effect, makes it difficult to obtain the long-term linked data sets on climate and disease that are necessary for the development of early warning systems (WHO, 2005). Human 'drivers' are also shaping ecosystem services that impact on human well-being (e.g., Muriuki et al., 2005; van Jaarsveld et al., 2005). Several areas, for example, Zimbabwe, Malawi, eastern Zambia, central Mozambique as well as the Congo Basin rainforests in the Democratic Republic of Congo, underwent deforestation at estimated rates of about 0.4% per year during the 1990s (Biggs et al., 2004). Further threats to Africa's forests are also posed by the high dependency on fuelwood and charcoal, major sources of energy in rural areas, that are estimated to contribute about 80 to 90% of the residential energy needs of low-income households in the majority of sub-Saharan countries (IEA, 2002). Moreoever, fire incidents represent a huge threat to tropical forests in Africa. An estimated 70% of detected forest fires occur in the tropics, with 50% of them being in Africa. More than half of all forested areas were estimated to have burned in Africa in 2000 (Dwyer et al., 2000; Kempeneers et al., 2002). Bush fires are a particular threat to woodlands, causing enormous destruction of both flora and fauna in eastern and southern Africa (for an extensive and detailed review on the role of fire in southern Africa, see SAFARI, 2004). The African continent also suffers from the impacts of desertification. At present, almost half (46%) of Africa's land area is vulnerable to desertification (Granich, 2006). Access to energy is severely constrained in sub-Saharan Africa, with an estimated 51% of urban populations and only about 8% of rural populations having access to electricity. This is compared with about 99% of urban populations and about 80% of rural populations who have access in northern Africa (IEA, 2002). Other exceptions also include South Africa, Ghana and Mauritius. Extreme poverty and the lack of access to other fuels mean that 80% of the overall African population relies primarily on biomass to meet its residential needs, with this fuel source supplying more than 80% of the energy consumed in sub-Saharan Africa (Hall and Scrase, 2005). In Kenya, Tanzania, Mozambique and Zambia, for example, nearly all rural households use wood for cooking and over 90% of urban households use charcoal (e.g., IEA, 2002, p. 386; van Jaarsveld et al., 2005). Dependence on biomass can promote the removal of vegetation. The absence of efficient and affordable energy services can also result in a number of other impacts including health impacts associated with the carrying of fuelwood, indoor pollution and other hazards (e.g., informal settlement fires - IEA, 2002). Further challenges from urbanisation, rising energy demands and volatile oil prices further compound energy issues in Africa (ESMAP, 2005). The juxtaposition of many of the complex socio-economic factors outlined above and the interplay between biophysical hazards (e.g., climate hazards - tropical cyclones, fire, insect plagues) is convincingly highlighted in the impacts and vulnerabilities to disaster risks and conflicts in several areas of the continent (see, for example, several reports of the International Federation of the Red Cross and Red Crescent Societies (IFRCRCS) of the past few years, available online at http://www.ifrc.org/; and several relevant documents such as those located on http://www.unisdr.org/) (see Figure 9.1b). Many disasters are caused by a combination of a climate stressor (e.g., drought, flood) and other factors such as conflict, disease outbreaks and other 'creeping' factors e.g., economic degradation over time (Benson and Clay, 2004; Reason and Keibel, 2004; Eriksen et al., 2005). The role of these multiple interactions is well illustrated in the case of Malawi and Mozambique. In 2000 in Malawi, agriculture accounted for about 40% of the GDP, a drop of about 4% from 1980. The real annual fluctuations in agricultural, non-agricultural and total GDP for 1980 to 2001 show that losses during droughts (e.g., as occurred in the mid-1990s) were more severe than disaster losses during the floods in 2001 (Benson and Clay, 2004) (for more details on structural causes and drought interactions and impacts, e.g., food security, see Section 9.6.1). Likewise, the floods in Mozambique in 2000 revealed a number of existing vulnerabilities that were heightened by the floods. These included: poverty (an estimated 40% of the population lives on less than US$1 per day and another 40% on less than US$2 per day); the debt problem, which is one of the biggest challenges facing the country; the fact that most of the floodwaters originated in cross-border shared basins; the poor disaster risk-reduction strategies with regard to dam design and management; and the poor communication networks (Christie and Hanlon, 2001; IFRCRCS, 2002; Mirza, 2003). Conflicts, armed and otherwise, have recently occurred in the Greater Horn of Africa (Somalia, Ethiopia and Sudan) and the Great Lakes region (Burundi, Rwanda and the Democratic Republic of Congo) (Lind and Sturman, 2002; Nkomo et al., 2006). The causes of such conflicts include structural inequalities, resource mismanagement and predatory States. Elsewhere, land distribution and land scarcity have promoted conflict (e.g., Darfur, Sudan; see, for example, Abdalla, 2006), often exacerbated by environmental degradation. Ethnicity is also often a key driving force behind conflict (Lind and Sturman, 2002; Balint-Kurti, 2005; Ron, 2005). Climate change may become a contributing factor to conflicts in the future, particularly those concerning resource scarcity, for example, scarcity of water (Ashton, 2002; Fiki and Lee, 2004),). It is against this background that an assessment of vulnerability to climate change and variability has to be contextualised. Although the commonly used indicators have limitations in capturing human well-being (Arrow et al., 2004), some aggregated proxies for national-level vulnerability to climate change for the countries in Africa have been developed (e.g., Vincent, 2004; Brooks et al., 2005). These indicators include elements of economy, health and nutrition, education, infrastructure, governance, demography, agriculture, energy and technology. The majority of countries classified as vulnerable in an assessment using such proxies were situated in sub-Saharan Africa (33 of the 50 assessed by Brooks et al., 2005, were sub-Saharan African countries). At the local level, several case studies similarly show that it is the interaction of such 'multiple stresses', including composition of livelihoods, the role of social safety nets and other social protection measures, that affects vulnerability and adaptive capacity in Africa (see Section 9.5).